Light Sources: UVPaqlites plus Bonus Reading – Survival Fiction! For me, the main appeal of UVPaqlites was their advertised ability to recharge. Secondly, I wondered just how much light they would provide. Given my concerns, the Scout Pack was a good starting choice as it allowed me to test one UVGloStik, one UVO Necklace, one Tooblite, and one Small UVPaqlite. Each item did in fact, “glow all night” after charging during the day. The amount of light, of course, is relative to each product’s size. 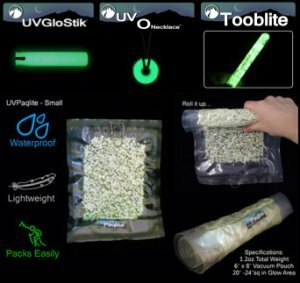 The UVO Necklace, Tooblite, and UVGloStik all work well for marking pieces of gear or objects in a room or camp. The Small UVPaqlite is my favorite of the bunch, as it would easily illuminate a small tent if necessary. In hindsight, the Larger UVPaqlite or the UVMatlite would have been a better choice for me, as I believe they will easily illuminate a dark room during a power outage. Of course, the combination of my Scout Pack with any of the larger UVPaqlites will vastly improve my abilities to function in the dark, and I plan to place another order soon. A: They are glow-in-the-dark lights. Our products utilize a specialty formulated non-toxic- glow-in-the-dark crystal called Strontium Aluminate. Their unique jagged shape allows them to absorb light from nearly all angles which maximizes that light absorption. The absorbed light is then stored inside the crystals and when taken into a dark environment, they glow! Q: What are they crystals made from? A: The crystals are made from Strontium Aluminate and combined with a rare earth called europium. They are all non-toxic & environmentally friendly. Strotium is actually found in some toothpastes. They do not produce heat, radiation, or any harmful side effects. They are basically made from dirt/earth. Q: How bright are the UVPaqlites? A: The large UVPaqlite provides enough light to act as a night light in a 6 person tent or small bedroom. The medium UVPaqlite, in my opinion, is the perfect 3-4 person tent light. It provides just enough light to see your surroundings, find your socks, etc. but not enough to keep you awake. A lot of our customers use the small or medium UVPaqlites on their night stands. The mini UVPaqlite is more like a marker used to identify trails, locations, items, exits, etc. *BONUS MATERIAL – SURVIVAL FICTION! So modern gear, such as UVPaqlites, makes survival much easier. The following sample chapter from THE CAVE AND THE SEA, A NOVEL, discusses the use of fire and a unique improvised light source to illuminate a cave. Enjoy! The journey back up the hill to the Cave was not a long one though it took its toll on Coe. The Cave had safely sheltered him so far, but more work would be required for it to be considered an ongoing solution. He could feel his energy waning. Upon exiting the rocky clearing near the spring, Coe gathered a few necessities: the sharpest small rock he could find, as his obsidian razor was delicate and he could not risk breaking it on more rugged work; several globules of pine resin that had seeped from the larger pine trees near the clearing; and four flat, stackable rocks that were easy to carry. If the gods continued to smile on him, he would sleep warm, happy and hidden that night. By his judgment he would have almost four hours of daylight left to accomplish his tasks, though he worried that his body’s energy stores would fall before the sun did. He placed his sharp and flat rocks just outside the Cave entrance along with the pine resin and noticed that a ray of afternoon sunlight had fallen through an opening in the thicket near his working area. Quickly he peeled multiple handfuls of cedar bark from the surrounding trees and placed it on a rock in the sunlight. The bark felt dry when he gathered it, but he wanted to take advantage of the afternoon sun to ensure that his fire-making materials would contain no moisture whatsoever. Under normal circumstances, Coe would use a hand-drill to start a fire; but with an injured left arm and a lack of energy, a bow drill solution was more viable. The cedar slash provided a straight stick that would serve as his spindle and a wide, flat stick that could be split into a fireboard. As he started to carve a handle, he realized that one of his flat rocks was round enough, like a hollow bowl, to provide an effective handle that would not require carving. He found a long, curved branch to serve as his bow and planned to use a piece of cordage from his bandages to complete the bow-drill set. He wanted to inspect the cut on his arm anyway; and if he had enough firewood, he could easy reapply the cordage and bandage before sleeping. He gathered dry firewood for more than an hour. After placing his sizable stash of firewood just inside the Cave entrance, Coe took his newly acquired, rugged-sharp rock and began carving his spindle and fireboard. The stone instrument was crude but adequate in creating a fine point on one end of the spindle and in halving the fireboard. He used his obsidian razor from his hidden waistband pocket once but did not want to risk breaking it as he would need it later for more delicate tasks. Before attempting to turn the spindle with his bow, Coe took several small bundles of cedar bark, mixed them with balls of pine resin, and placed them individually on the small flat rocks, which served as baseplates. If he could get a fire going, his day would be near complete. Being naturally left-handed, he had grown up using his right hand to steady the spindle handle and his left hand and arm to work the bow. In this case his injury would require that he work the bow right-handed, and he wished that he had taken his grandfather’s advice more seriously when Grandfather had warned him to learn to use both hands for basic tasks. He removed the leather cordage from the bandage on his injured left side and got to work. At first the bow did not turn easily, and Coe began to feel scared; but his awkward right-handed cadence improved, eventually burning a starter hole in his fireboard. He had to use his obsidian once more to create the notch in the board and stopped to rest after organizing his materials around him. He used a small portion of firewood to construct a tipi fire-lay just outside the cave entrance. This small fire would be for temporary use until he could move into the Cave and build a larger fire. To his relief, the cedar bark was bone dry, and though he nearly exhausted himself turning the bow, he watched the marriage of the spindle and fireboard produce dark, fine dust and eventually a small spark. With care he cradled the spark in a bundle of bark and coaxed it into a flame with gentle breaths. His tipi fire took immediately, warming his body and his spirit, inducing yet another sense of natural, primal gratitude. This time he offered his prayer of thanks without stopping his work. Coe allowed the fire to burn for a few minutes to produce a small coal bed. He carefully dragged a portion of the coals away from the fire with a stick and then placed the glowing coals on two of his baseplate stones. Almost immediately, the cedar bark/pine resin mixtures ignited, providing Coe with lamps that he could easily carry by gripping the baseplates. He was proud of his work and knew that each of the four lamps would burn for just under an hour. He planned to be asleep before the lamps burned out. See the original IntheRabbitHole article here.